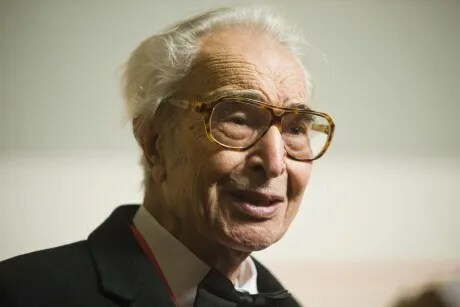 Scientific American pubblica un bell’articolo di Evelyn Lamb su Dave Brubeck, il pianista jazz morto il 5 dicembre 2012 (avrebbe compiuto 92 anni il giorno dopo) e Salon, bontà sua, ce lo ripropone (Dave Brubeck is good for your brain – Salon.com). Vi invito a leggerlo per intero, anche se vi richiede qualche sforzo (è in inglese). Più sotto ve ne propongo un assaggio, e 2 video d’incoraggiamento. Jazz legend Dave Brubeck died December 5, just one day before his 92nd birthday. The pianist and composer was an innovator, especially when it came to combining rhythms and meters in new ways. “He sort of tired of the traditional patterns of jazz,” says Patrick Langham, a saxophonist and faculty member of the Brubeck Institute at the University of the Pacific in Stockton, Calif.
Time Out, the hit 1959 album by the Dave Brubeck Quartet, was one of the first popular jazz works to explore meters beyond the traditional 4/4 and 3/4. (The first number, which is the top number of the time signature in sheet music, represents the number of beats in the measure, and the second number represents the note value that receives one beat. 4/4 means that there are four beats and a quarter note lasts for one beat, yielding four quarter notes in each measure.) “Take Five“ and “Blue Rondo a la Turk,” two of Brubeck’s most popular works, are both on Time Out. London says that Brubeck’s rhythms can play with the listener’s innate toe-tapping ability—the technical term is entrainment. “Whenever you start doing anything in rhythm the whole motor center of the brain starts lighting up.” He notes that musicians and nonmusicians do equally well on tests of this ability. It appears to be an innate skill, part of the way we interact socially. Asymmetrical meters may be appealing because they test people’s native entrainment ability and keep the brain more active while listening and performing. “The asymmetrical meters do make you work a little harder to make you stay along with them, and that’s part of their appeal, attraction and charm,” London says. Ascoltare questi pezzi è un piacere, ma Take five è stata scritta da Paul Desmond e quindi il merito del ritmo in 5/4 è suo anche se poi Dave Brubeck è più famoso.